By Miriam Valverde on Friday, January 27th, 2017 at 12:30 p.m.
President Donald Trump laid out an ambitious agenda for his first day in office: at least 17 different actions, from repealing the health care law to renegotiating trade deals to suspending immigration from terror-prone regions. As his first day approached, Trump said he wouldn’t consider Inauguration Day his "day one," that it would be the following Monday because he didn’t want to mix up document-signing with celebrations. 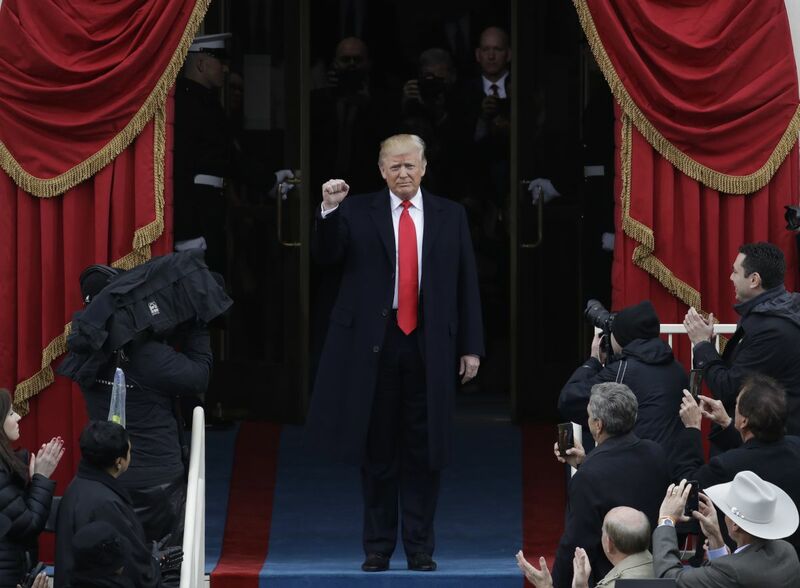 But Trump did knock out a few things on Inauguration Day, among them: an executive order to advance the repeal of the Affordable Care Act, an Inauguration Day proclamation and a waiver that allowed his nominee for defense secretary to serve. In the days that followed, Trump released more directives outlining new approaches to trade and crackdowns on immigration. Other areas remained untouched despite his pledge for immediate action. Trump had promised to terminate a program started under Barack Obama’s administration that deferred deportation for immigrants who came to the United States as minors, for instance, and to label China as a currency manipulator. Asked why those were not happening on "day one," White House spokesman Sean Spicer said "part of it is to make sure that we don't spend our entire day signing executive orders." "There's a way that we can do this to make sure that we're getting all of those things that he promised the American people done in short haste," Spicer said, "and doing it in a way that doesn't just jam them out in a fire hose." Here’s our recap of Trump’s major actions during his whirlwind first full week as president. After taking the oath of office, Trump vowed to end "American carnage" in his inaugural address. His speech included a highly misleading characterization of America giving away its wealth to other countries. The United States remains the wealthiest nation in the world by GDP and GDP per capita, so we rated his claim Mostly False. 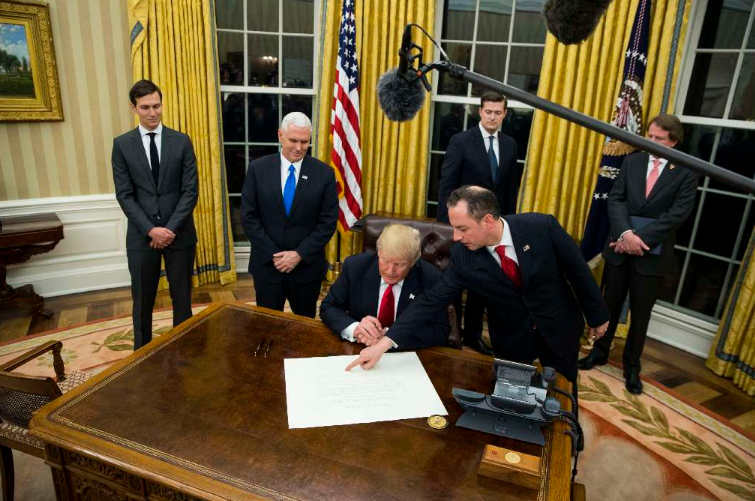 Executive order on Affordable Care Act: One of Trump’s hallmark campaign promises was to repeal and replace the health care law enacted during Obama’s administration. As Congress weighed what to do, Trump signed an executive order to minimize the law’s "economic burden." It authorized federal agencies to "waive, defer, grant exemptions from, or delay the implementation" of any part of the law that fiscally burdened states or cost money for individuals, health care providers and a host of others. Analysts told us Trump’s order may be more symbolic than substantive since it doesn’t advance his goal to repeal the law and doesn’t create any new authority for executive branch agencies. We rate the campaign promise In the Works. Signed waiver bill into law, formalized Cabinet nominations: Trump signed into law a bill passed by Congress providing an exception to the legal requirement of seven years between military active duty and service as secretary of defense. The waiver allowed Gen. James Mattis, who retired from the Marine Corps. in 2013, to serve as secretary of defense, following Senate confirmation. Trump also signed paperwork formalizing his Cabinet nominations. Regulatory freeze: Trump’s administration also took steps toward his promise for a moratorium on regulations. Chief of staff Reince Priebus issued a memorandum asking the heads of executive departments and agencies to not send new regulations to the Office of the Federal Register, to withdraw regulations already sent but not published, and to delay the effective date for regulations published but not yet in effect. The regulatory freeze, allowing for emergency situation exceptions, would be in place until a Trump department or agency appointee reviewed and approved the regulation, the memo said. The new White House did not release more presidential actions over the weekend, though it did make headlines: Trump said he had the largest audience ever to witness an inauguration (Pants on Fire); Trump blamed the media for his feud with the intelligence community (False); and senior adviser Kellyanne Conway introduced "alternative facts" on NBC’s Meet the Press. 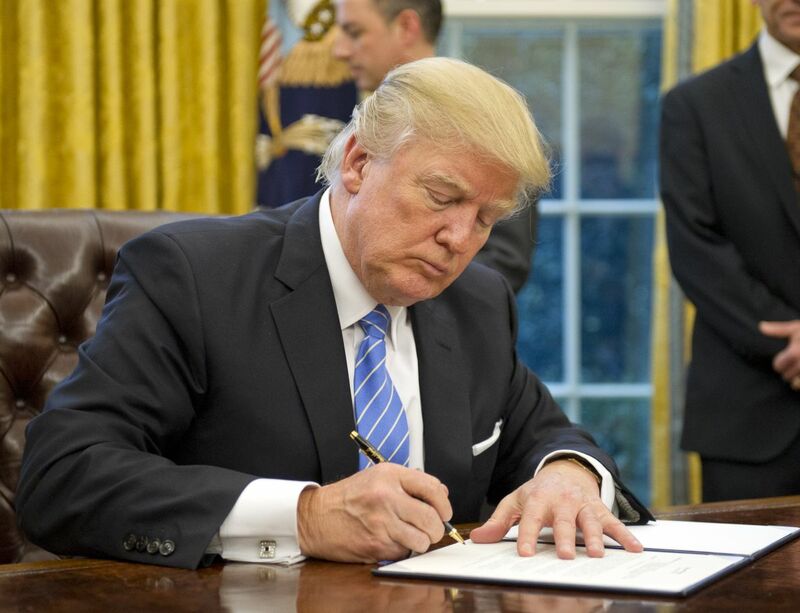 TPP: Trump issued a presidential memorandum for the United States to withdraw from the Trans-Pacific Partnership negotiations and agreement, fulfilling a campaign pledge, though Congress was not going to ratify the trade pact anyway. "We just officially terminated TPP," Trump said. Mexico City policy: Trump through a memorandum reinstated a policy instituted during Ronald Reagan’s presidency that prevents foreign non-governmental organizations from receiving U.S. government funds if they perform or promote abortions for family planning. Hiring freeze: Trump signed a memorandum ordering a federal hiring freeze of civilian employees. The order does not extend to the military (and allows exemptions for positions deemed necessary for national security or public safety). Trump had promised to "reduce the federal workforce through attrition," and his action moved the pledge to In the Works. "This memorandum counters (the) dramatic expansion of the federal workforce in recent years," press secretary Sean Spicer told reporters Jan. 23. We rated this claim Mostly False as it compares workforce numbers in an abnormally low point (end of the Bill Clinton administration) to a relatively normal point in 2016. Also, a broader set of data from the Bureau of Labor Statistics shows just 2 percent growth over the same time period. That night, reports showed that Trump -- once again -- told congressional Republican and Democratic leaders that he would have won the popular vote had it not been for 3 million to 5 million instances of voter fraud. The claim is Pants on Fire-level baseless, but Trump would not back down. Tuesday, Jan. 24: The pipeline president? As part of his America First agenda, Trump via memorandum instructed the secretary of commerce to develop a plan under which new, retrofitted, repaired and expanded pipelines in the United States "use materials and equipment produced in the United States, to the maximum extent possible and to the extent permitted by law." "From now on, we're going to start making pipeline in the United States," Trump said as he signed memoranda for the construction of pipelines. 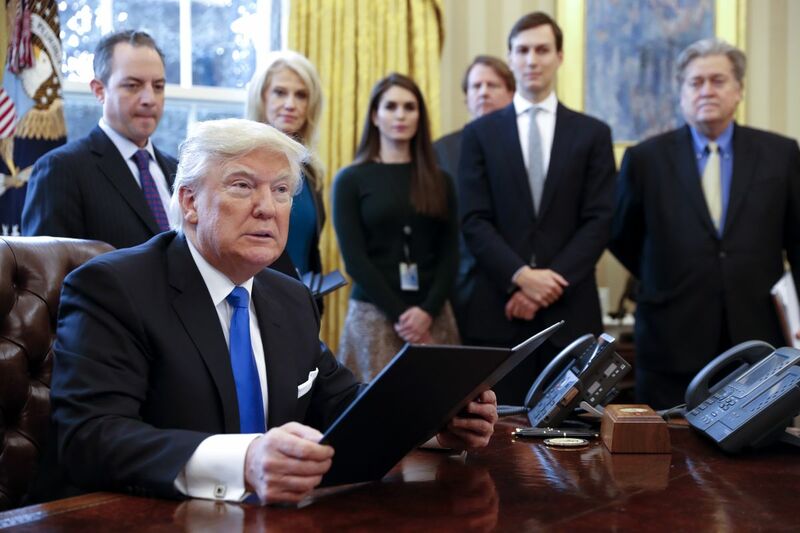 Keystone XL Pipeline: Trump also signed a memorandum to allow TransCanada Keystone Pipeline, L.P. to re-submit its application for a presidential permit to build and operate the Keystone XL Pipeline. The pipeline, expected to flow more than 800,000 barrels of oil a day from Canada to the Gulf Coast, has had significant opposition from environmentalists. In his presidential campaign, Trump pledged to approve the pipeline in exchange for a share of the profits. This promise rates In the Works. Dakota Access Pipeline: Additionally, Trump signed a memorandum to advance construction of the Dakota Access Pipeline, a project the Obama administration’s Army Corps of Engineers halted by not approving an easement needed for the pipeline to cross under Lake Oahe in North Dakota. The pipeline has drawn protests from environmentalists and North Dakota’s Standing Rock Sioux Tribe, which say the construction threatens their sacred sites and endangers their drinking water. Expedite environmental reviews: Trump also signed an executive order to "streamline and expedite" environmental reviews and approvals for infrastructure projects. Trump kicked off the day tweeting, "I will be asking for a major investigation into VOTER FRAUD, including those registered to vote in two states, those who are illegal and....even, those registered to vote who are dead (and many for a long time). Depending on results, we will strengthen up voting procedures!" This allegation of millions of illegal votes has earned Trump a Pants on Fire and Sean Spicer a False rating for wrongly using a Pew study to bolster the claim. 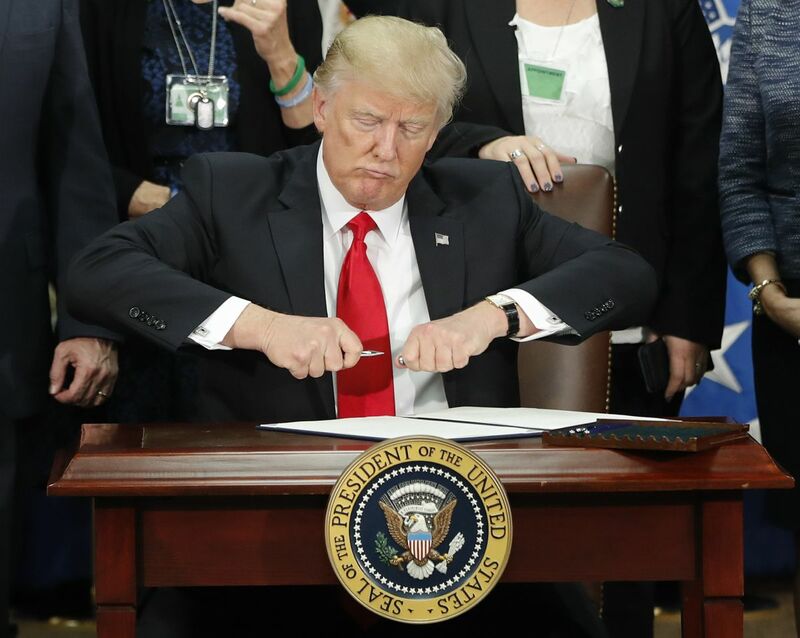 Border wall: Trump signed an executive order to propel his big campaign promise of building a wall along the U.S.-Mexico border. The order directs departments and agencies to "deploy all lawful means" to secure the southern border and prevent further illegal immigration, and instructs the secretary of homeland security to "take all appropriate steps to immediately plan, design, and construct a physical wall along the southern border, using appropriate materials and technology to most effectively achieve complete operational control of the southern border." This is a promise we’ve rated In the Works. Triple ICE officers: Trump directed through an executive order the hiring of an additional 10,000 ICE officers. Pending funding and employment, this promise is In the Works. Sanctuary cities: Trump signed an executive order instructing the attorney general's office and the secretary of homeland security to withhold grant money from so-called sanctuary cities, generally regarded as places with policies limiting assistance to federal immigration authorities. It’s a directive to look at funding streams and figure out how they can be cut off, the White House said. Trump’s plan to defund sanctuary cities is a pledge we rate In the Works. In the evening, Trump sat for an interview with ABC News’ David Muir at the White House, doubling down on falsehoods about millions of fraudulent votes cast in the election, his inauguration audience size and refugee vetting. A scheduled Jan. 31 meeting between Trump and Mexican president Enrique Peña Nieto was canceled. Trump tweeted that if Mexico was unwilling to pay for the wall, then it was better to call off the meeting. The New York Times reported before Trump’s tweet that the Mexican leader was already thinking of cancelling the meeting. Trump’s press secretary said a way to get Mexico to pay for the border wall -- something Mexico has repeatedly said it won’t do -- could be by imposing a 20 percent tax on all imports from Mexico. Spicer later toned down that suggestion, saying it was just "one idea," the New York Times reported. Trump addressed GOP leaders in Philadelphia and falsely told them homicides in the City of Brotherly Love are "terribly increasing." Philadelphia's murder numbers were higher in 2016 than in 2014 and 2013, but lower than 2015 and the third-lowest since 1990. All told, his first seven days in office amounted to four executive orders and eight memoranda, according to the White House website as of noon Jan. 27. Armed services: And on his eighth day in office, Trump went to the Pentagon for the swearing-in of Gen. James Mattis as defense secretary and to sign executive actions. One of them Trump said would "begin a great rebuilding of the armed services of the United States" and develop a plan for new planes, new ships, resources and tools for the military. Trump campaigned on promises to strengthen the military. In his inaugural address, Trump claimed the U.S. Navy has shrunk since 1991, that’s Mostly True. Vetting measures: Trump also signed an executive action that he said would establish new vetting measures to keep radical Islamic terrorists out of the country. "We don’t want them here. We want to make sure that we are not admitting into our country the very threats our soldiers are fighting overseas," Trump said. "We only want to admit those into our country who will support our country and love deeply our people." One of Trump’s campaign promises is to suspend immigration from terror-prone places. WhiteHouse.gov, "Presidential Memorandum Regarding Construction of the Keystone XL Pipeline," Jan. 24. WhiteHouse.gov, "Presidential Memorandum Regarding Construction of the Dakota Access Pipeline," Jan. 24. WhiteHouse.gov, "Presidential Memorandum Streamlining Permitting and Reducing Regulatory Burdens for Domestic Manufacturing," Jan. 24.